Brussels: Household spending and exports kept the euro zone’s economy alive in the third quarter, the EU said on Tuesday, but collapsing confidence points to a recession and probably gives the European Central Bank (ECB) ground for another interest rate cut. Growth in the 17 countries sharing the euro was just 0.2% in July to September, the same as the second quarter, the European Union’s (EU) Statistics Office Eurostat said in its second reading of the data first released on 15 November. But in a sign of evaporating confidence at factories and businesses across the region, investment was flat for the second quarter running and companies sold down inventories, which subtracted 0.2% from the quarterly figure. Imports took away another 0.4%. For many economists and the ECB, which cut rates by a quarter point to 1.25% in November, a recession is all but a certainty, as the euro zone’s sovereign debt crisis drags the economy down, squeezes bank financing and freezes investment. “We are effectively going into a recession but we are still very far from the recession of 2008-2009," said Francois Cabau, an economist at Barclays Capital, who sees euro zone gross domestic product (GDP) contracting by 0.4% in the fourth quarter and another contraction at the start of 2012. Other investment banks and economists foresee a deeper contraction of 0.5% in the October to December period. A dip along those lines would be greater than the 0.2% fall in GDP in the second quarter of 2009, according to Eurostat, but still far from the 1.8% decline in late 2008 that signaled the deepest recession since the 1930s. Many economists expect the ECB to cut rates again to 1.0% on Thursday at the bank’s meeting in Frankfurt to reduce the costs of lending and boost the euro zone, which accounts for about 16% of the world economy, according to EU data. “We now lean towards the view that interest rates could well come down to 0.5% in the early months of 2012 even though they never went below 1% during the 2008-9 recession," said Howard Archer at IHS Global Insight. A mild recession at best? Even with the euro zone’s economy in positive territory in the third quarter, Spain, the euro zone’s fourth largest economy, saw growth grind to a halt in the period, and the Netherlands, home to major European multinationals, experienced a contraction of 0.3% in the quarter. 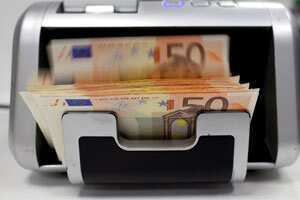 Growth in the bloc’s two largest economies, Germany and France, was only 0.5% and 0.4% respectively. Portugal, which is receiving emergency funding in return for enacting tough reforms, saw its economy contract 0.4% in the third quarter. After two years of failing to draw a line under the debt crisis, European leaders will hold a summit in Brussels on Friday to try to calm panicky markets worried about a possible default in Italy and a potential break-up of the euro zone. France and Germany hope investors will be reassured by a master plan involving EU treaty change to impose budget discipline across the euro zone, but the crisis has already escalated so far that economists say their projections of only a mild recession depend on some resolution being reached soon. “If, contrary to our expectations, the debt crisis escalates, the recession will be much deeper and more protracted," said Christoph Weil, an economist at Commerzbank.